Help make this our biggest Big Give yet! Give to SAFCC March 15-22! Last year, a call came to our SAFCC helpline. John, the manager at an apartment complex, said his complex had 20 cats on the property. Some of the cats were pregnant and one had mange, which he feared would spread to the other cats. He and apartment residents were desperate for help. We receive many calls from apartment managers with situations like this and know that the outcome for many community cats that live at apartments is not a good one. As an all-volunteer group, our ability to help community cats depends on our volunteers and on those who support the work we do. This year, the Big Give 2018 is on March 22 and we are asking for your support in a big way! The Big Give is our largest fundraiser and this year our ambitious fundraising goal is $25,000! We hope to reach this goal by individual donations and by winning prize money. To help us reach our goal, you can help by donating the minimum of $10 and--most importantly--getting other people to donate the minimum too! Prize money is awarded to those organizations with the most unique donors, so the more people who donate, the greater our chances of winning prize money. Even better news, now you can donate before the big day. The Big Give 2018 will be open for donations a whole week before the big day, starting on March 15. Please visit and share our page, to get the word out. Want to find out how this story ends? Click HERE . The Travelers Community Connections Matching Gifts Program has sent a matching gift in the amount of $1000 to SAFCC. Special thanks to Board Member and volunteer, Megan Carr for this grant. Donations by Travelers employees like Megan to eligible 501(c)3 organizations like SAFCC are matched dollar for dollar, starting at $50 and up to $500 per employee per calendar. SAFCC received $500 for Megan's volunteer hours and the remaining $500 for the matching gifts program. We are so grateful to Megan and to businesses like Travelers that recognize the hard work their employees do with community organizations. Stop by our adoption event and meet your future furry companion! Petco Foundation will give organizations who have 5 or more adoptions in store on March 3, an adoption grant of $35 per cat. Adoption fee includes neuter, rabies shot, FVRCP shot, feline leukemia and FIV test (negative), and microchip. Can't make the event? You can always view our adoptable cats HERE. Our event season is picking up and our need for volunteers to staff these events have never been greater. Community events offer us the opportunity to spread the word about the benefits of TNR and what our organization does, so our presence is very important! Wondering what to do with your used car or truck? Donating your old vehicle to SAFCC is convenient, easy, and may qualify you for a tax deduction. And best of all, your donation of a used car or truck will support our community cat work! All you need to do is to complete a simple online form or call 1-866-628-2277 and they will take care of the rest. They will pick up your vehicle, arrange to have your donation towed, and provide you with a tax-deductible receipt, all at no charge to you. Thank you Leigh Young & Monica Alvarado for donating their 2007 Toyota Corolla under Vehicles for Charity. SAFCC received $1,180 and they received a tax deduction! Have you attended our TNR class and successfully addressed your outdoor overpopulation problem? Then let us know! We know there are a ton of success stories out there that can demonstrate the numerous benefits of TNR and we would love to highlight it in our newsletter, website and on social media. If you have a story to share, please email your trapping success story and any pics HERE. Thank you! Thank you to SpaySA for funding 50 feral surgeries in the 78209 zip code! The surgeries must be done at the Animal Defense League and only apply to 78209 cats NOT from Alamo Heights. Trappers will need to show proof of residency. This is a great time to get ahead of those kitty litters! Please visit our website HERE for information on TNR grants and specials. Andrew (pictured) reached out to SAFCC last summer to help him with the cats he feeds behind Haven for Hope, where he lives. This is a homeless man doing what he can to help homeless cats. SAFCC volunteers now deliver food to him but unfortunately, the cats are still reproducing. It is a dangerous location and we have not been able to get trappers to trap there. It is too dangerous for women, so we are looking for a "few good men" to help get these cats fixed. Andrew can help - he just has no money and no car. If you are able to help, please email us at info@sanantonioferalcats.org. SAFCC will pay spay/neuter fees at one of our partner clinics. Select SAFCC as your charity and triple your impact! Shop and support SAFCC at no cost to you . Get iGive and you can shop and support SAFCC at no cost to you! Click here to start: www.igive.com/GvP7k7yout their website . Celebrating a birthday? Need to cater a work luncheon? Or just need to re-fuel while shopping? 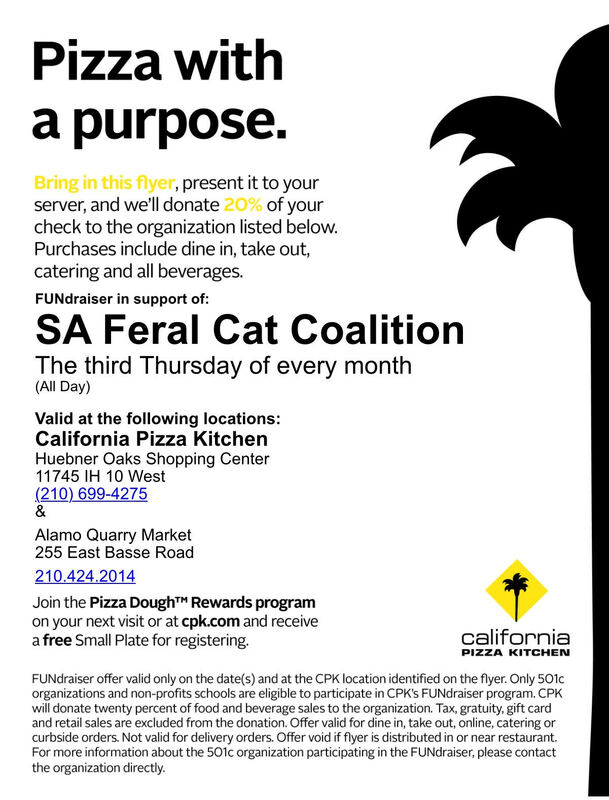 Present this FLYER when you dine in/take-out/cater on March 15 and 20% of your bill will be donated to SAFCC.